In May 2014, Vanesa was in her last month of graduate school, poised to take a state board exam and about to move from San Francisco to Oakland. It hardly seemed an auspicious time to adopt a dog. Jean Luc flashes a smile. 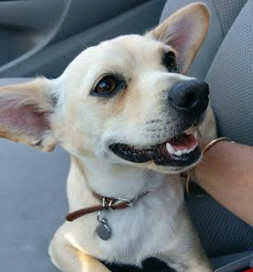 When she saw a cute little Chihuahua mix named Jean Luc looking back at her from her computer monitor, her heart leaped, and she knew he was the one. 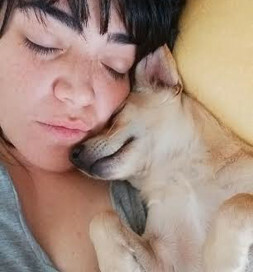 “What got me were the big brown eyes, so loving, and I could just see how much he wanted his own person to love.” He was listed by Kate’s Rescue for Animals in Los Banos, California, and was in a foster home. During their first meeting, she got “a little wave of cold feet” and said she’d take the weekend to think about it. The fosterer understood and gently took Jean Luc from her lap where he had been sitting. Jean Luc settles in with Vanesa.